The effect of the London 1863 Football Association code has always been considered minimal in the United States and the reasons why have eluded most soccer, rugby and football historians over the past century. With the recent availability of old newspapers on the internet, this author has been trying to find what type of foot-ball games were being played by what teams during the 1800s. More emphases are being put on contemporary newspaper reports now than using previous historical football writings. It took almost ten years, March 13, 1873, before representatives of seven Scottish football clubs met in Glasgow and formed the Scottish Football Association. Scotland is considered the second ‘country’ to use the London 1863 FA code. Wales is considered the third ‘country’ to do the same in 1876. The ground shall be 400 feet long by 250 feet broad. The distance between the posts of each goal shall be 25 feet. The number for match games shall be 20 to a side. To win a game 6 goals are necessary, but that side shall be considered the victors which, when the game is called, shall have scored the greatest numbers of goals, provided that number is 2 or more. To secure a goal the ball must pass between the posts. No player shall throw or carry the ball. Any violation of this regulation shall constitute a foul, and the Player so offending shall throw the ball perpendicularly into the air to a height of 12 feet and the ball shall not be in play until it has touched the ground. When a ball passes out of bounds it is a foul, and the player causing it shall advance at right angles to the boundary-line, 15 paces from the point where the ball went, and shall proceed as in rule 5. No tripping shall be allowed, nor shall any player use his hands to hold or push an adversary. The winners of the toss shall have the choice of first goal, and the sides shall change goals after every successive inning. In starting the ball it shall be fairly kicked, not “babied”, from a point 150 feet in front of the starter’s goal. Until the ball is kicked no player on either side side shall be in advance of a line parallel to the line of his goal and distant from it 150 feet. There shall be two judges, one from each of the contesting colleges, and one referee; all to be chosen by the captains. No player shall wear spikes or iron plates upon his shoes. In all match games a No. 6 ball shall be used, furnished by the challenging side and to become the property of the victors. The number 5 rule states, ‘no player shall throw or carry the ball.’ These rules do not seem to fit the rugby or American gridiron football games, but most American soccer historians do not seem to accept them as their game either. There was no agreement to form a league or association at the New York City meeting. There were four games played using these rules during the fall of 1873. A number of these type games were played during 1874 and 1875. The last football game using these 1873 rules was played between the University of Pennsylvania and Princeton College on November 25, 1876. Five days later, on November 30, Princeton lost a foot-ball game to Yale using rugby rules. Yale had previously switched to carrying the ball, or the rugby game, on November 13, 1875. Columbia would switch to the rugby game on December 9, 1876, and Rutgers began the rugby game on October 27, 1877. If college soccer historians want to research association football information from 1865 to 1905, they must look through contemporary newspapers or under American gridiron football history at the specific colleges. The same approach has to be done when studying early rugby history in America from 1858 to 1918. All the college soccer and rugby games are considered early variations of the American gridiron football game. These games are still being listed under gridiron football at all the individual colleges playing both games during this early period. I will now follow a progression of the games of foot-ball played in America up into the 20th century. Foot-ball games were played in the 1600s in America whenever colonists found a little free time to relax and the weather was conducive to out-door activity. The American Indian also had their particular ball games. As time went on there were even a few games played between the colonists and the Indians. During the 1700s, a couple articles began to mention some foot-ball activity at some of the few American colleges in existence. The upper class students of Harvard University near Boston, Massachusetts, would make the Freshmen class supply the balls and footballs for the other classes to play games1. By 1765, undergraduates at Yale College in Connecticut played ball with foot and hand and the freshmen also had to find the bats, balls and footballs for the others classes to use2 Yale has a description of some foot-ball games being played between the two dormitories from a graduate of the class of 17973. Soon after 1800, Harvard saw the first foot-ball games being played between the two lower classes of freshmen and sophomores4. In the 1820s, Dartmouth College in New Hampshire already had games of foot-ball on the Green, and college students from Columbia College in New York City would play foot-ball games in the hollow on the Battery of Manhattan Island around 1820. Both Dartmouth and Columbia report the first pairings of two classes playing the other two classes in the 1820s. The double-class game became the big foot-ball game on the Dartmouth campus and was called the Old-Division game5. Those games pitted the Seniors and Sophomores vs the Juniors and Freshmen with innumerable numbers of players. In the 1830s, games of foot-ball were played on the Quad between the East and the West Dormitories of the College of New Jersey (now Princeton University). Princeton had begun playing the ballown form of ball-game around 1820. Players were allowed to bat the ball with the fist to forward the ball, along with kicking it. Players were selected alphabetically A to M vs N to Z 6. Class foot-ball games were also begun. The first score for a college class game of foot-ball is found at Yale College in 1840. One class beat another by the score of 2 Innings to 1 Inning. Cricket was the big game in the early- to mid-1800s and some colleges would use the cricket name of ‘inning’ whenever a goal was scored. Most colleges, like Harvard, used the name ‘game’ whenever a ball was kicked over a boundary line in the scoring of a goal. There were several types of games played to celebrate the opening of the Cricket and Archery Grounds in East Boston, Massachusetts, during the fall of 1843. On Oct. 19, 1843, a Mr. Dearing’s Party beat another team in a game of foot-ball. There were 12 men-a-side and the attendance was numerous7. In the fall of 1848, the Hamiltons played a foot-ball game with another team comprised of deacons, saints & firemen on the Winnisimmet Square in Chelsea, Mass. Many of the team players were served with $5.00 fines at the end of the game for playing on the downtown streets8. 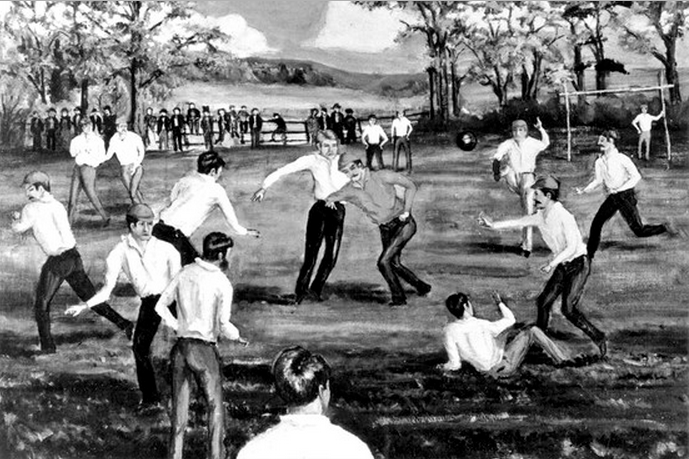 A rise in the level of foot-ball games being played took place at Haverford College, located on the west side of Philadelphia, on May 10, 1848. The college had been closed for over two years and reopened on that date. Many alumni attended the reopening celebration. A foot-ball game was played between the new students and accompanied by some faculty members, and a team of Alumni9. Games with Alumni have generally been counted and accepted by American colleges over the years. A great increase in foot-ball activity takes place in America in the 1850s. But some of the ‘mob-soccer’ games played with many players were being shut down by college administrators for ‘roughness’. Yale played its last big freshman-sophomore game in 1854 and the Harvard administration stopped their frosh-soph games after 1859. Princeton would form the first college football club in 1857 after the class games were done. Later on, the college football clubs would become known as varsity teams. Princeton also acquired the new leather ball in 1858 and kicking and dribbling the ball along the ground quickly replaced most of the batting of the ball with fists to get the ball over the goal line. Most of the Princeton football club games were played with dormitory and secret society teams of the college. There were also games with the nearby Princeton Theological Seminary, a 3-year graduate seminary college. This college was founded in 1812 as a separate institution. A St. George FBC was founded by players from the St. George Cricket Club around 1843. Apparently, only inter-squad games were involved until 1854, when the club was set to take a more involved role10. No foot-ball games have been found for this team until the 1870s, but there are newspaper references for at least a dozen other football clubs being founded by the onset of the Civil War in the spring of 1861. Very few inter-club games between them have been found as yet. Multiple foot-ball clubs have been found in the Boston area, the Baltimore area and New York City. The newspapers of other cities also report the formation of football clubs. One of the more important occurrences in the study of early foot-ball in the United States was played on Sept. 6, 1858. Apparently, members of Harvard’s Class of 1861 were greatly moved by the book written by Thomas Hughes in 1857, Tom Brown’s School Days. The first mention of a ball being ‘carried over a boundary line’ is found in a report of the Harvard Freshmen-Sophomore foot-ball game played on the first Monday night of the fall semester in 185811. This author has found only one previous report of carrying the ball in a foot-ball game. The Universal Asylum and Columbian, February 1792, Page 92, states in an article about the Choctaw Indians in Mississippi, ‘the Indians carried the ball after kicking it through the goal-posts’. The majority of all the games reported previous would mention kicking of the ball or sore shins from hacking. Most of the games were more likely to have been played as variations of the kicking game of foot-ball before 1858. Everyone always seemed to know what to do on the fields of play. Two months later and 80+ miles or 105km away from Harvard University, the Trinity College of Hartford, Connecticut, played a kicking game of foot-ball with men from the Hartford Town Team. A set of eight rules was agreed to before the game was played and is found in the Hartford Courant newspaper dated November 6, 1858, page 2. These rules were used in the game of foot-ball between twenty students of Trinity College and twenty “Town Boys”, in a game played at the South Green at 2pm, November 9, 1858. Each side shall choose two umpires, whose decision, under the following rules shall be final. A line shall be drawn at 50 feet from either bound, over which lines the sides shall not pass before the ball has been canted. There shall be no carrying of the ball. A clear space of at least ten feet shall be given in front of the ball after it has been caught. Fifteen minutes shall be allowed between each game. Players shall, under no circumstances, be allowed to hold on to one of the opposite party. Each must keep on their own side of the ball. If the ball goes over the side bounds, it shall be kicked through the middle by the player who gets it. The Hartford Town Team won the game; 3 games (goals) to 0. This game is listed on Page 195 of my 2008 book , Evolvements of Early American Foot Ball: Through the 1890/91 Season. After reading rule number 3, ‘no carrying of the ball’, copies of these rules were sent to several American soccer historians over the last five years. To date, I have never received any acknowledgments. At the present time, the only accepted American ‘soccer’ games played before the 1863 London code, were played by the Oneida Foot-Ball Club in Boston. Curiously, this foot-ball club was formed by students of the Dixwell Latin School of Boston, and the games played involved carrying the ball over the boundary line with descriptions of ‘flying tackling’ of the ball-carrier12. The ball used was round and perhaps that may be the leading factor in the acceptance of these games as variations of the kicking game? The soccer game is not currently accepted as being played in America before the 1860s. England was going through a transitional period beginning in the 1840s with attempts at coding two different games of foot-ball; the kicking and carrying games. Apparently, those 1858 rules written in Hartford, CT, are too early for American soccer historians to accept. Recently, I found a foot-ball game being played on the Boston Common on Oct. 31, 185913. This field was the same one where the Boston high schools were playing their carrying game of foot-ball. There was no one on the North American continent I could contact to help decide what kind of game was played. One of the teams, the Roxbury Aristonicans, was a cricket club and the other team, the Boston Unions, was a baseball club. Cricket clubs tended to play kicking games of foot-ball for exercise during the winter months in Australia14. My research has also found that to be true in America. The level of sport activity would take a big hit during the 1861-1865 period under the ravages of the Civil War in the States. Only high school activity can be found along with intermittent military camp kicking games. There were about six Boston preparatory schools and high school teams playing the carrying game of foot-ball begun at Harvard in 1858. These schools were oriented to graduate their students to enter Harvard University, so they quickly jumped on the new carrying game of foot-ball. The shape of the ball used by the high-schoolers continued to be round. The first oval football was not used in America until the second carrying game of rugby was played in Cambridge, Massachusetts, between Harvard University and McGill University from Montreal, Canada, on May 15, 1874. Presently, the first accepted intercollegiate football game was played between Rutgers University of New Brunswick, New Jersey, and Princeton University of New Jersey on Nov. 6, 1869. Most Gridiron Football historians accept this game as their first game of football. A few of them may realize it was just a kicking game, but they quickly say this was the first type of foot-ball game played in the early evolution of the American gridiron game. Soccer historians also accept the 1869 game as an association game of football15. By 1873 when the four colleges met in New York City, the newspapers seemed to be more interested in the decision of Harvard University NOT attending the meeting in New York City. That college was playing a carrying game of foot-ball, ‘so at variance to the game played by the other four colleges, that no advantage could come from their attendance’16. When the major colleges of the northeast United States embraced the rugby game in the mid-1870s, the number of college association football teams dropped to a minimum for a few years. Both games of association football and rugby continued to be labelled together under gridiron football. Football historians discuss the change to the carrying game from a kicking game as just another early evolvement of the gridiron football game. There is another peak in the number of colleges playing the association game of football in the 1880s, but it drops off again to a few schools in the 1890s. In 1882, when the carrying or rugby football game is changed to a ball-control game using the series-of-downs rule to determine who has possession of the ball, it also was just considered another step in the evolvement to the gridiron game of foot-ball. Contemporary newspapers would call it a new game of foot-ball. It was called the American Intercollegiate Football game, because it was promulgated by Walter Camp and delegates from Harvard, Princeton and Yale. They were all members of the Intercollegiate Football Association; first formed in 1876 and the leading football organization in the country. There were no contemporary football historians in America until the mid- to late-1880s. The first sports’ historian to write about foot-ball was Henry Chadwick. In his 1884 book, The Sports and Pastimes of American Boys, he discusses all forms of recreational activity including three forms of foot-ball17. He discusses and compares the Association Football, the Rugby game and the American College Football game. In his next book, published in 1887, he dedicates the entire book to the three forms of foot-ball being played in the USA 18. Independent clubs founded by manufacturing workers after 1880 in Northeast New Jersey and Southeast Massachusetts began to form teams and played the association game of football. Several clubs were also formed in the British and Irish communities in St. Louis, Missouri. The growth in the number of association football clubs becomes greater and spreads around the country as the decade progresses. So far, the author has found a half-dozen independent association football clubs with scores during the season between August 1, 1880 through July 31, 1881. There are over sixty teams found during the 1885/86 season and over one-hundred and sixty teams during 1890/91. There is a levelling off in the association football team counts from the mid-1890s into the 1900s. Yale University first selected Eugene V. Baker, Class of 1877, as the Father of Football in December 189319. He had a lot to do with installing the rugby game at Yale in 1876. Walter Camp, the consensus leading football authority from Yale, played rugby for Yale during 1876-1881. He remained at Yale and began to write articles about foot-ball from 1886 into the 20th century. He called the new game the American Rugby Football game, not the American Collegiate Football game. He wanted to emphasize the beginning of the rugby game at Yale in 1876. Through his continued writings and rules’ decisions until his death in 1925, he became known as the Father of American Football. Parke H. Davis, Princeton graduate of the class of 1893, wrote the first extensively-researched book of the American football game in 1911. He researched all foot-ball back to 1869 and included all the major college association football games up to 187620. As stated previously, Harvard University and Haverford College had announced in 1905 they played the first ‘soccer’ game, not the first ‘association football’ game. 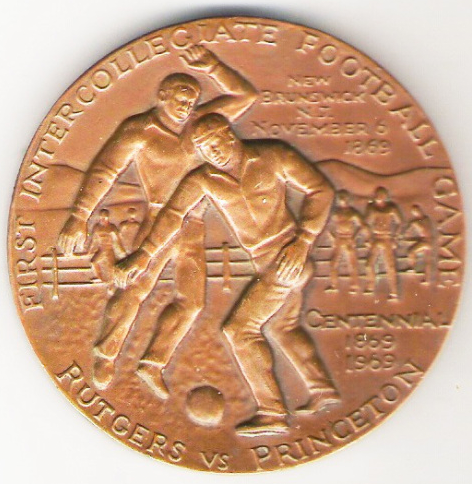 When there was a 50-year anniversary celebration of the 1869 Rutgers-Princeton game of football in 1919, the soccer community did not feel any desire to participate. It was celebrated as the first American gridiron football game. The soccer community also did not seem to celebrate the game at the 100th anniversary celebration in 1969 either. It will be interesting to see if any soccer historians make any statements about the 1869 association football game being an early soccer game when the 150th anniversary celebration is held in 2019. There is a need for some highly-respected soccer and rugby research societies or associations to be formed in the USA. The understanding of what types of early foot-ball games was played by what teams in the 1800s has not been addressed as yet. It will take unbiased interactions between three different historical foot-ball societies of soccer, rugby and football to convince all the colleges to understand what games they were really playing in the 1800s. 1. Benjamin A. Hall, A Collection of College Words and Customs, 1856 (revised), Harvard University Press. 2. Clarence Deming, Yale Yesterdays, 1915, p. 192, Yale University Press. 3. James Murdoch, Brief Memoirs of the Class of 1797, 1848, p. 54, Yale University Press. 4. Boston Daily Advertiser, “Reminiscences of Harvard College: No. VIII,” Aug. 29, 1870, pages 2 & 3. 6. Parke H. Davis, “Origin of College Football,” Trenton Sunday Times-Advertiser, Oct. 17, 1909. 7. Boston Daily Transcript, “Athletic Games at East Boston,” Oct. 29, 1843. 8. Boston Herald, Dec. 1, 1848, p. 4. 9. Alumni Association, History of Haverford College for the First 60 Years, 1892, p. 288. 10. Spirit of the Times, On Dits in Sporting Circles, 1854, Vol. 24, No. 34. 11. John A. Blanchard, The H Book of Harvard Athletics, 1923, p. 326. 12. John D. Lovett, Old Boston Boys and the Games They Played, 1907, Riverside Press, Boston, MA. 13. Boston Evening Transcript, Nov. 1, 1859. p. 2. 14. Roy Hay, “A Tale of Two Footballs: The Origins of Australian Football and Association Football Revisited,” 2010, Sport in Society, Vol. 13, No. 6, pages 952-969. 15. Roger Allaway, Colin Jose, David Litterer, The Encyclopedia of American Soccer History, 2001, Appendix B, p. 414. 16. Parke H. Davis, Football: The American Intercollegiate Game, 1911, p. 59. 17. Henry Chadwick, The Sports and Pastimes of American Boys: A Guide and Text-Book of Games of the Playground, the Parlor, and the Field, 1884, pages 97-107, George Routledge & Sons, NYC. 18. Henry Chadwick, The Game of Football, 1887. 19. Los Angeles Herald, Dec. 31, 1893, p. 8. 20. Parke H. Davis, Football: The American Intercollegiate Game, 1911, pages 44 & 45. This paper was first presented on September 2, 2013 at the 150th Anniversary of the 1863 Football Association Rules celebration in Manchester, England. Some of these games seem closer to Australian rules football. Rutgers should give the slogan to the soccer team of the first intercollegiate football game played not the football team!!!!!! and take the statue of the guy running with the ball at Rutgers stadium down !! that’s not correct either.